Copier tabs are plain, unprinted tab divider sheets that you can run through your printer or copier to customize yourself. These printable tabs are perfect for any office that wants the ability to print their own tabs on-demand, without having to wait on a print shop to do it for them. They can also be found in those same print and copy shops to offer fast turnaround on custom index tabs for those who wants standard papers. When it comes to copier tabs, you will want to be sure that your printer or copier machine can handle the tab sheet before you run them. Typically this information can be easily found in your machine's user manual or online at the manufacturer's website. We also have a list of common copiers in the industry that they work well with, though these are by no means the only models that work; most leading brands of copiers and printers easily accept our copier tabs. Your copier might also only accept a particular collation of copier tab, so you will want to check that in your manual as well. Whether that be reverse collated, double reverse collated, straight collated, or uncollated, you can find copier tabs in any collation you need. Copier tabs can help your business improve efficiency and save time and money. They give you the ability to create custom labelled tabs for your ring binders (or other bindings), and because the body of the sheet is also blank, you can easily create a fully customized tab with your logo, or anything else. Copier tabs are available unpunched or pre-punched with 3-holes for standard letter size ring binders. 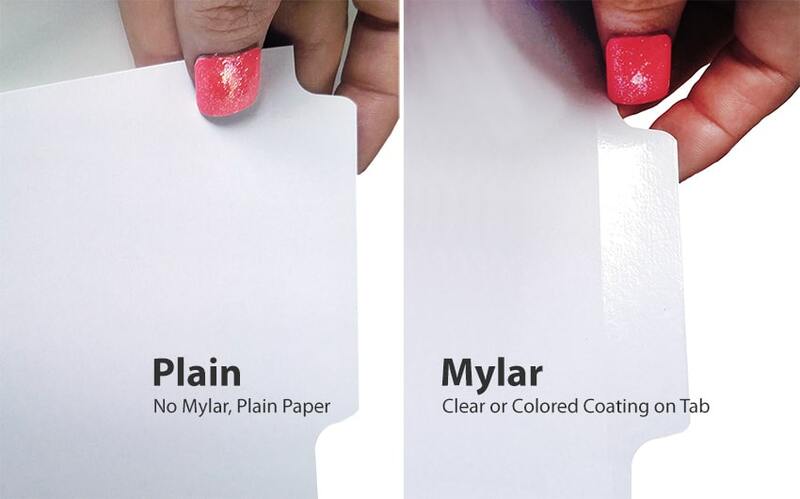 They are also available either with or without mylar, which is a coating on the tab extension that makes it more durable and tear-resistant. The tab cut is another option you will choose from when you buy copier tabs. The cut refers to the number of tabs you will find per bank, i.e. the number of tabs that are visible when your set is assembled. This is not the same as the number of tabs per set because a set might have, for example, 10 tabs, but with a 1/5 cut, you would only see 5 when the set is assembled, and the other 5 would be behind that. The tab cut indicates the length or size of your tab as well. 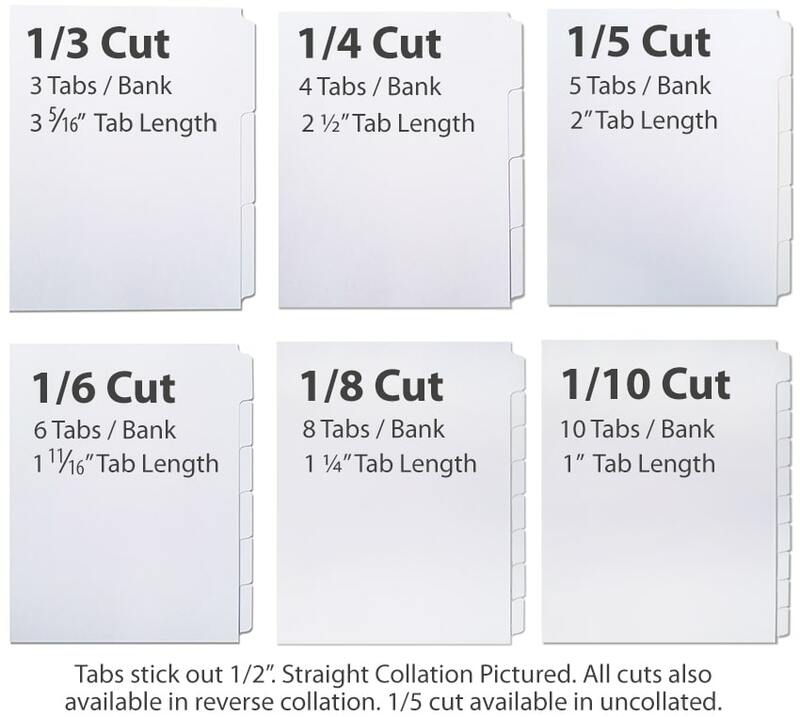 The most common tab cuts are 1/3 cut, 1/5 cut, and 1/10 cut, though 1/4, 1/6, and 1/8 are also available. Copier tabs are most common in the letter size, which is 8 ½" x 11" plus the 1/2" tab extension, making the overall sheet size 9" x 11". In addition to letter size copier tabs, we also have half size mini tabs that measure 5 ½" x 8 ½" (6" x 8 ½") and legal size 8 ½" x 14" (9" x 14"). Docucopy index tabs from Holmberg are the most popular brand of tabs, but what is more important is actually the paper stock thickness and brightness. Most copier tabs are 90# index (the '#' is pronounced as 'pound'). 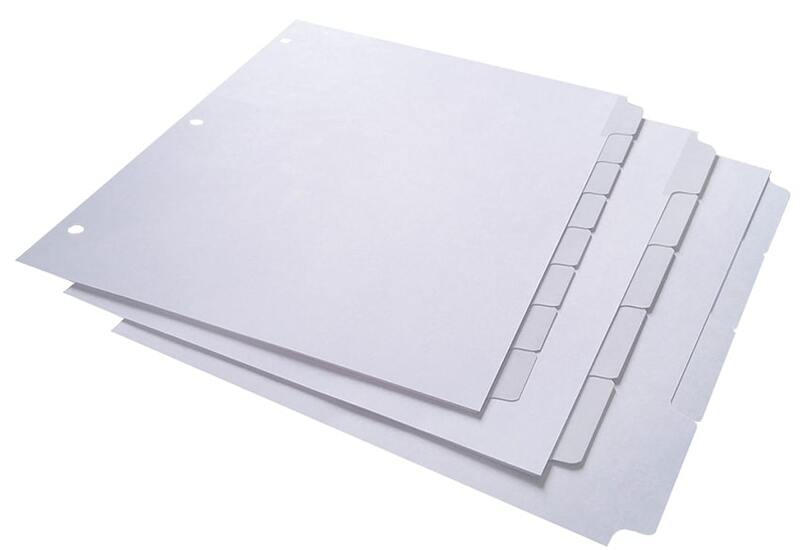 Your copier or printer will play a big part in the smoothness of how your index tabs are run, as will the paper stock. You can find copier tabs in a huge variety of businesses and organization operations, including medical offices, retail suppliers, print shops, law offices, schools, marketing, and government. Print your own index tabs for ring binders (or any other need) with copier tabs. Sometimes called Xerox tabs, these copier tabs offer the highest quality so you can count on them to feed, print and run through your equipment smoothly while providing you with the professional look that your office requires.